Statistics published by Petnet (Pet Ownership Statistics in Australia, 2002) show that nationally there are 2.8 million households with dogs and 1.7 million households with cats  64% of the 7.2 million households in Australia own a pet. Of the dogs that attend vets, 70 to 80% are suffering atopic skin problems and 10% of cats share the same misfortune. Our product was developed for use over a period of 5 years after our animals began suffering skin conditions that brought intense discomfort. This resulted in self-mutilation and substantial degradation of skin condition. The Itch NO-More! line was introduced to customers primarily for horses by mail order to interstate clients, and through agents at markets locally. Initially, the smallest available size was 500ml. The demand for it to be available in much smaller quantities to accommodate the dog and cat market became evident through feedback from the market agents. The salve is made from 6 essential oils and mineral oil, with wood tar that is coffee coloured for dogs. Similar ingredients without wood tar form the transparent product for cats. The product is only ever applied once per day with reducing frequency of applications. 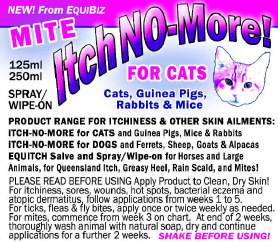 Itch NO-More for Dogs and Itch NO-More for Cats available in Salve and Spray/Wipe-On versions! Stop itching within minutes, bring soothing relief to inflamed skin, and promote rapid healing and fur regrowth. Each salve contains no anaesthetics (which in other products provide artificial and temporary pain relief of itching and sores), but instead significantly improves actual healing and accelerates recovery. It is also an insect repellent and does not wash off in the normal course of water activities and is very safe for human contact. 75ml of the product goes a long way and will treat a Labrador size dog for about 2 months, used at the proscribed rate (see chart below) for a cure  there will be a little left over for a rainy day. 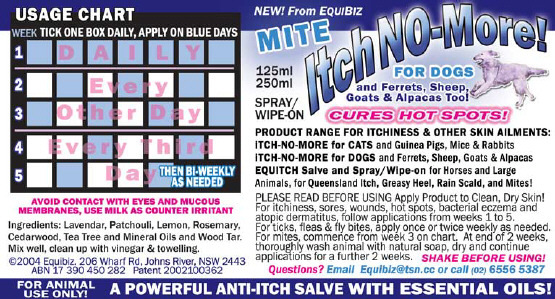 MITE Itch NO-More Spray/Wipe-On Also Available! The main users are people with dogs and cats with skin problems, especially hot spots, but also bacterial and grass mite eczema, atopic dermatitis, fly bitten ears, wounds and flea allergy sores. 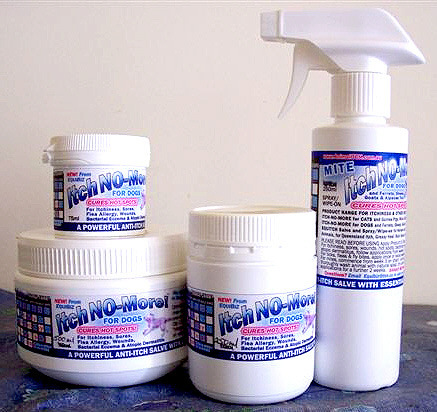 The product can also be used on guinea pigs, rats, mice, rabbits, ferrets, sheep, goats, and alpacas. International Patent Application lodged May 2003. Registered Trademark Itch NO-More is under application. Although much positive verbal feedback was gained from market agents a survey of the Itch NO-More products was conducted in June 2003 to establish overall customer appraisal in writing as trial data for the national retail representation. Survey with these customers has shown an extremely high approval rate for curing atopic skin problems where other products had consistently failed. Other products respondents had used include soaps, shampoos, powders as well as last-resort treatments such as cortisone treatment. It was shown that there is also strong resistance from pet owners to use corticosteroids. 50% Cessation of itching from shortly after applications up to 2 hours later. 100% would use the product again. 100% very happy with price. 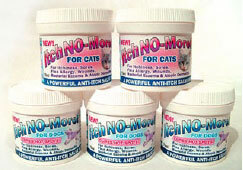 Itch NO-More for Dogs and Itch NO-More for Cats have a 100% success rate! Only product used which cured as well as alleviated the irritation that caused dog to chew his skin to bleeding point. Hair grew back better than before! 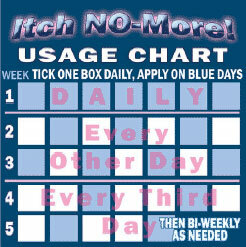 Itch NO-More customers are extremely happy with the product and expressed the need to keep the product on hand at all times for future use. READ MORE ON WHAT OUR CLIENTS SAY HERE! Read Itch-NO-More Product Tips Here!